Philippe Faucon’s Fatima has won multiple awards this year, among them the César for best film. This did not come without controversy. Indeed, a few hours after his win, Guillaume Gallienne of the Comédie-Française questioned the award’s artistic legitimacy. Gallienne had not even seen the film when he shared his opinions about Fatima’s César wins. He simply heard the foreign name that makes up the title, realized that a young Brown woman (Zita Hanrot) had won the Best Newcomer prize, and saw that the veiled face of an actress (Soria Zeroual) fills the film’s poster. None of this sat well with him. He accused the voters of making a political statement, which also referred to Abderrahmane Sissako’s Timbuktu win at the previous year’s ceremony. It could only be pro-diversity propaganda. It would take an entire essay to deconstruct Gallienne’s words—Faucon himself responded to him pretty well already. But what such comments compel us to do is to defend the film beyond its representational politics, and above all put the film into the context of the director’s filmography. Sabine, Samia, and now Fatima: many of Philippe Faucon’s titles announce the director’s modest aims—each revolving around a single character. Faucon has been chronicling the lives of young French people since the end of the eighties starting with his first feature, L’amour. Though his work has received critical accolades, culminating in a 2015 retrospective at the Cinémathèque Française, his films have not garnered equivalent popular attention in France or overseas. Of all the breakout young French directors of the nineties, such as Claire Denis, Arnaud Desplechin, and Xavier Beauvois, he remains an obscure figure. Last year, after the attacks against Charlie Hebdo, he was put in the spotlight due to his prophetic La Désintégration, a film that, four years before, recounted the bombing of NATO headquarters in Brussels by three young radicalized men. Faucon’s films, especially his more recent ones, which focus on the French-Arab experience, show an affection for domestic workers, their gestures and the spaces their bodies navigate. More specifically, he tends to return to the figure of the cleaning lady, who stands in for the immigrant mother archetype, each time taking up more and more space in the narrative and on-screen. Her presence, haunting the frame, crystallizes the shame and frustrations experienced by her children while representing the limits of the French Republic meritocratic ideals. Until now, in such films as Samia, Dans la vie, and La Désintégration, Faucon has privileged the point of view of the children—torn between two homes, caught in contradictory desires of assimilation, detached from the familial structure while asked to remain loyal to their origins. His latest, Fatima, finally gives top billing to the immigrant mother/cleaning lady, whom he had left stunned and powerless in a cruel shot at the end of La Désintégration. Each of Faucon’s films can be seen as a response and even a corrective to the one that came before it. La Désintégration, the story of a young man’s swift radicalization into jihadism, is a follow-up to the 2001 coming-of-age story Samia, about a young girl craving emancipation from an oppressive family structure represented by her overbearing and violent brother. Few films have explored the peculiar existential turmoil experienced by immigrant mothers, especially in relation to language barriers. A loose adaptation of the Moroccan writer Fatima Elayoubi’s poetic memoir Prière à la lune, Fatima attempts to depict in 79 minutes the inner conflicts of a mother constrained by her inability to speak French. In Black Skin, White Masks, Frantz Fanon dedicates his first chapter to Black people and their relationship to language, stating, “To speak means to be in a position to use a certain syntax, to grasp the morphology of this or that language, but it means above all to assume a culture, to support the weight of a civilization.” Fatima’s incapacity for French not only puts her on the social margins in a country where mastery of the language is the sine qua non for achieving so-called “integration,” more tragically, it also sets her apart from her own teenage daughters, the studious Nesrine and the rebellious Souad (Kenza Noah Aïche), whose entry in medical school forces Fatima (Soria Zeroual) to take on more cleaning jobs. From the beginning, Faucon orchestrates a choreography of language between the three main characters. The mother speaks Arabic, the daughters reply in French; they can understand each other, but they do not belong to the same time and space. The daughters’ mother tongue is not that of the mother, and Faucon, through constant static shots tightly framing the faces of his actresses, demonstrates how that can be not only a source of anguish but principally for the daughters a way to distinguish themselves from their mother’s lower status. 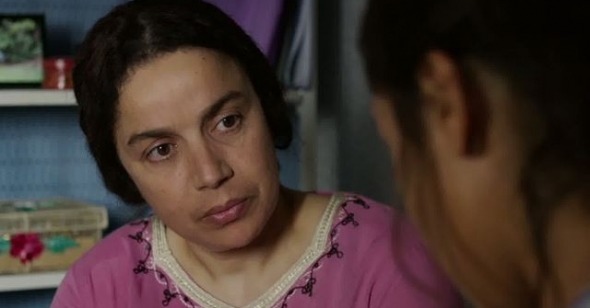 Power dynamics between Souad and Fatima in particular explode in shared dialogue scenes, during which Souad takes advantage of her mother’s illiteracy to assert herself. Nonetheless, the most violent scenes are the ones when Fatima simply remains silent. Silence is a torturous and imposed state, and the film traces an emancipation from silence that will come through writing. At the end, a cathartic flow of speech reveals the interiority of this troubled, yet lucid, self-possessed woman.